We are now entering our seventh World Series of Poker Main Event final table where the November Nine concept is being utilized, and the one thing I have I come to realize over the past six installments is the November Nine works… sometimes. The idea for the November Nine came after what could arguably be considered the worst final table in WSOP Main Event history, the 2007 WSOP won by Jerry Yang. During the final table there was a lack of overall talent, personality, and dramatic play as Yang overbet and luckboxed his way to the title. We were also coming into the age of instantaneous coverage of everything, including poker, so the WSOP was losing a lot of its intrigue as everyone was already aware of who won and how the final table played out. So, in 2008 we got the innovative idea for the November Nine. A concept that allowed ESPN and the WSOP to promote the players at the final table (think of it as additional character development of sorts) as well as to allow ESPN to show the final table in as close to real-time as possible. The 2008 November Nine didn’t have all that much in the way of star-power (Dennis Phillips, Ivan Demidov, Scott Montgomery, Peter Eastgate, Ylon Schwartz, Darus Suharto, David Rheem, Craig Marquis, and Kelly Kim) but it did have a couple interesting storylines to work with, Chino Rheem, Peter Eastgate looking to become the youngest Main Event Champion, and the everyman Dennis Phillips. Overall the November Nine format seemed to be neutral both in terms of its impact on the ratings and its acceptance by the community –with some people liking it and others not so much– so ESPN and the WSOP decided to give it another go in 2009. In 2009 the World Series of Poker hit the proverbial jackpot when Phil Ivey made the final table, but Ivey was not the spokesman that many felt he would be (whether this was on Phil or ESPN/WSOP dropping the ball, or a combination of both is unclear) and despite the best-known poker player in the world making the November Nine it didn’t really have that much of an impact, or at least not as much as many felt it would. I think without Ivey this might have been the end of the November Nine format. That being said, I also think ESPN and the WSOP liked having the final table play out as close to live as possible, so it was brought back once again in 2010. In 2010 the WSOP caught lightning in a bottle for the second straight year as another big named in the poker world, Mike Mizrachi made the final table along with several other very strong pros. The WSOP also added an online live stream to the coverage in 2010, and despite a lot of buffering, freezing and lag it was a pretty well received addition to the coverage, and seems to have planted the seeds for the next development to the November Nine concept. 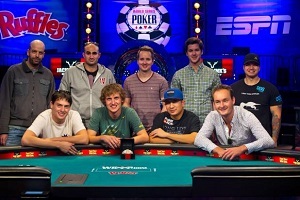 The 2011 final table was shown for all intents and purposes live on ESPN2 and ESPN over a two-day period, and the heads-up coverage lasted right through the night and into the following morning’s Sports Center. So as people were waking up to catch Sports Center they instead caught the end of a dramatic heads-up battle between Pius Heinz and Martin Staszko. This was a great reintroduction for peopled who may have forgotten about poker since the Moneymaker Boom days. The best thing that ever happened to ESPN was the grueling and long heads-up match. Nowadays the format in use is pretty much set –play down to the final table, go on a three month break and return to show the final table on a slight delay live on ESPN2 and ESPN. In my opinion, the live stream was everything the November Nine was supposed to be, and personally I think it’s great for the WSOP Main Event final table. But the November Nine format itself doesn’t really work if there is nothing to promote, and this year there is really nothing to promote –nor was there very much last year. In fact, when you have a table full of nobodies (no offense guys) I think you lose some of the appeal as the public sort of falls out of love with their stories during the three month hiatus. ESPN and the WSOP did away with the November Nine and let the tournament play out naturally, showing JUST the final table in real time on a live stream. ESPN could then produce their pared-down telecasts and show them after the fact, never again showing the live stream. Sure, people will know who won, but we did from 2003-2007 and ratings were just fine. Poker on TV: Dead and Buried or Ready for a Comeback? What Happened to Creating a Good Atmosphere at the Poker Tables?